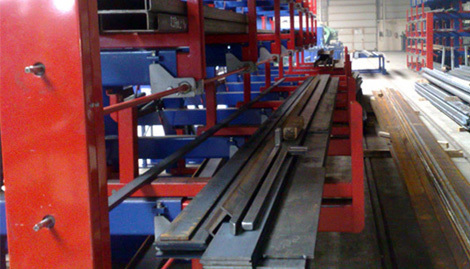 The automated roll out cantilever rack consists of a series of roll out cantilever racks mounted on rails. Thanks to these rails the racks can be moved electrically. 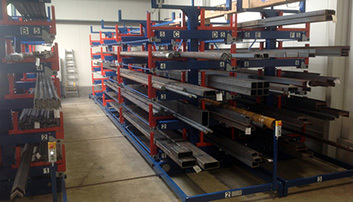 Just like the standard roll out cantilever rack, this system is suitable for the compact storage of all types of long profiles. 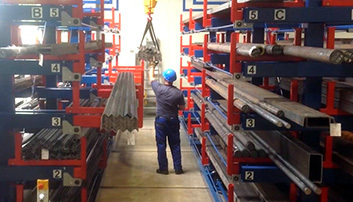 Pipes, profiles, bars, hollow sections, bars, flat iron, … are stored in an orderly manner. Besides the benefits of the regular roll out rack, this automated roll out cantilever rack boasts an extra advantage: this advanced model saves a considerable amount of space. Unlike immovable racks, where you need multiple aisles, you only need one aisle with this innovative model, irrespective of how many racks you use for storing your long profiles. By eliminating several aisles, you can set the same amount of racks on half the surface. This means a considerable cost reduction (electricity, heating,...). 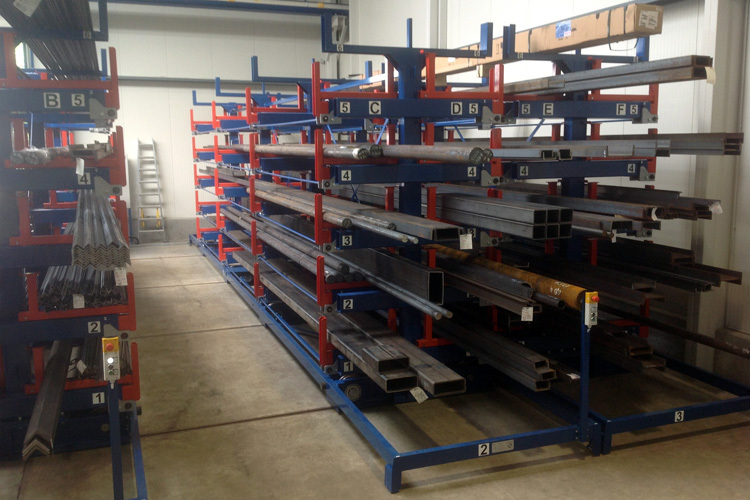 You can also double the number of roll-out cantilever racks on the same surface. That means that you can double the loading capacity without any structural investments. For the operation of the roll out drawers, you can choose manual (with a handle) or electrical control. When you opt for electrical control, you simply have to push the button to automatically extract the drawer from the rack. If you choose to work manually, you can still smoothly roll out the drawer with the crank, even if it is heavily loaded. Each drawer can be completely extracted from the rack, thus ensuring full access to your long profiles. 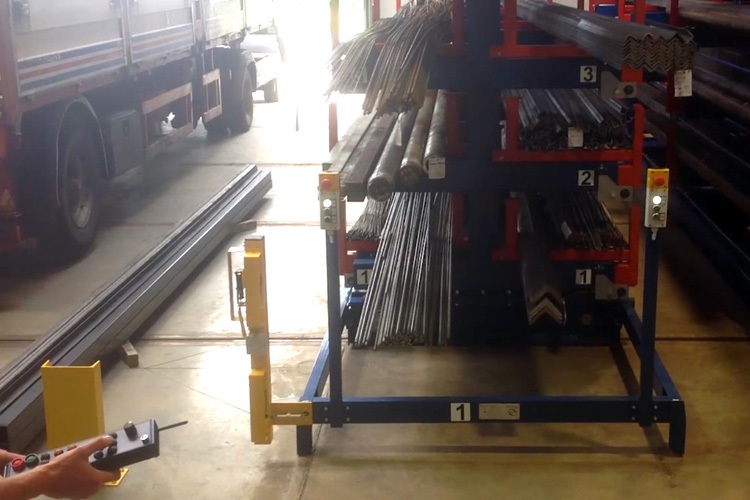 With a loading crane you can easily and safely load or unload your long profiles. 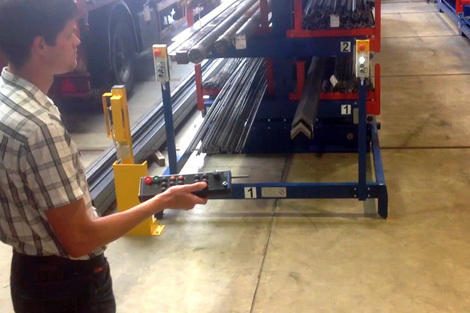 Since there is only one person required to execute this handling and since the drawer is completely outside the rack, this is a safe and fast way of working. 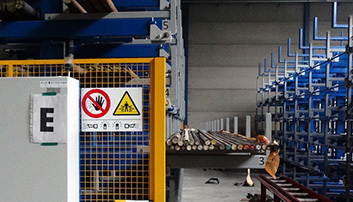 Just like the regular roll-out cantilever rack, you can store materials of 3, 6, 12, 15 or even 20 meters in this automated rack. As a client, you choose the number of drawers, the loading capacity, the depth and the height of the drawer. 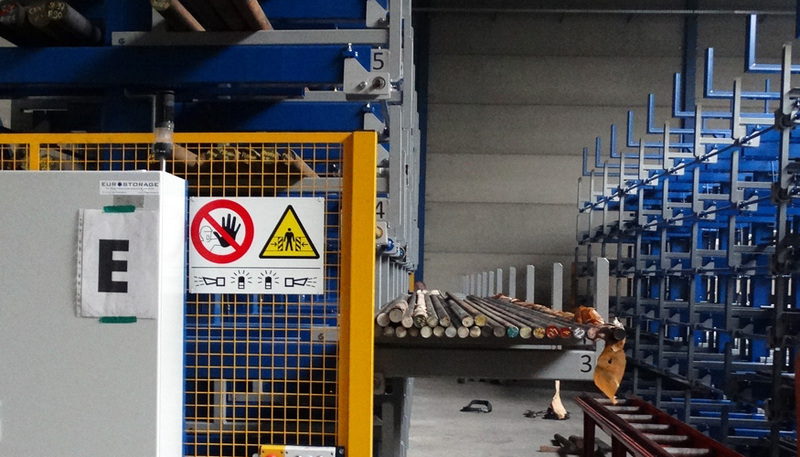 Furthermore, you can choose the number of racks mounted on the rails. In other words, this kind of solution is completely adjusted to the needs of the customer. 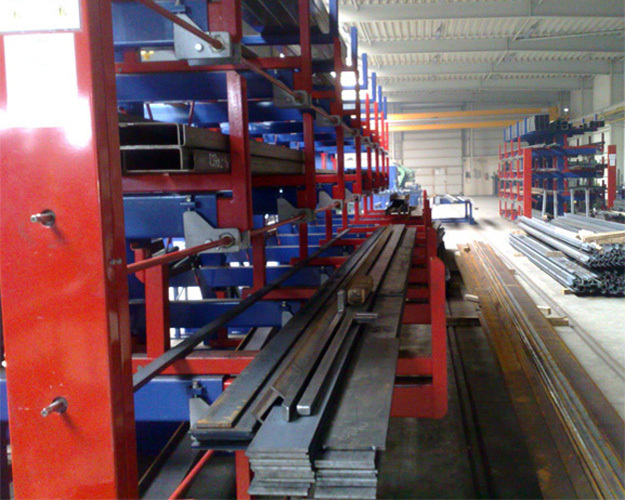 ¨Placing several cantilever racks against each other saves a lot of space. Instead of an aisle between each rack, only one aisle is needed in this case. 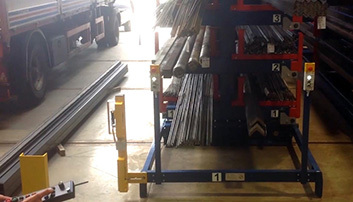 The aisle is large enough to execute the handling with a loading crane. Loading and unloading are done in one single movement, safe and quick. To guarantee your safety, the racks are equipped with sensors. The racks stop moving as soon as somebody enters the aisle. Each roll-out drawer can completely be extended from the rack. 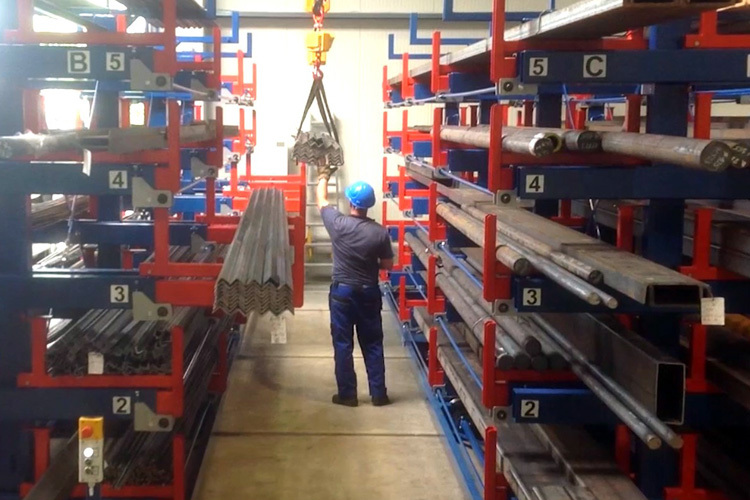 For quick and easy loading and unloading with a crane. 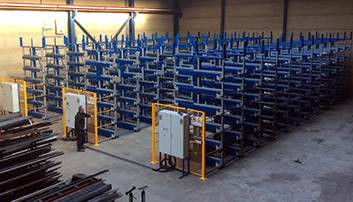 Thanks to the mobility of each individual rack, you can place several racks against each other. With the electric control, you can easily create an aisle next to the desired rack. Unlike immovable racks, where you need multiple aisles, you need only one aisle with this innovative system, no matter how many racks you use for the storage of your long profiles. You can also use an electrical control for extending the different drawers. This system is highly comfortable, since it gives you full acces to your profiles with one single push of the button. If you do not want to use electric control, you can roll out the drawers manually, using a lever. This works in the same way as the standard roll out rack.